Black Scottish people (also referred to as the Black Scottish, and Black Scots) represent a small proportion (less than 1 per cent according to the 2011 census, although rapidly rising) of the country's overall population, although the Black population of Scotland has a long history. Scottish played a leading role in the slave trade and by 1817 it was estimated that one third of all enslaved people in Jamaica were held by these Scots. This role in slavery led to more documented Black population in Scotland, as slave owners brought enslaved back to serve as household servants. Some of the population was from the earlier history of the Moors presence in the United Kingdom, mostly in Scotland and Ireland. In some cases, the enslaved people were freed through manumission. According to the 2011 UK Census people self described as African, Caribbean, Black or any other Black background make up around 1.0 per cent of Scotland's population, compared to 3.0 per cent of the overall UK population. A report in 2000 suggested that Black people in Scotland had difficulties in feeling a sense of Scottish identity. The British Guiana-born Andrew Watson is widely considered to be the world's first black association footballer to play at international level. He was capped three times for Scotland between 1881 and 1882. Watson also played for Queen's Park, the leading Scottish club at the time, and later became their secretary. He led the team to several Scottish Cup wins, thus becoming the first black player to win a major competition. With some brief exceptions, such as Jamaican Gil Heron at Celtic, Walter Tull signing for Rangers, and John Walker at Hearts, Black players largely disappeared from Scottish football for the next 100 years until the arrival of Mark Walters at Rangers in 1988. Walters arrival at the club resulted in incidents of racial abuse. Tavish Finnegan Degroot, more well known as the "Demoman", from Team Fortress 2, is a self-described "black Scottish cyclops". Jerome "Chef" McElroy, a character from South Park, hails from Scotland. Jim "Jock" McClaren, a character in Porridge. Elmo McElroy in The 51st State is a descendent of a relationship between a slave and their owner who is of the McElroy clan; thereby making him the heir to the ancestral estate. 1 2 "Statistical Bulletin : 2011 Census: Key Results on Population, Ethnicity, Identity, Language, Religion, Health, Housing and Accommodation in Scotland - Release 2A" (PDF). 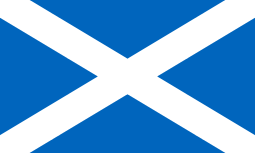 Scotlandcensus.gov.uk. Retrieved 2015-08-10. ↑ "Scotland and the Abolition of the Slave Trade". Ltscotland.org.uk. Retrieved 4 August 2015. ↑ "Black servants in Scotland". Ltscotland.org.uk. Retrieved 4 August 2015. ↑ "Analysis of ethnicity in the 2001 Census – Summary report". The Scottish Government. 2004-02-09. Retrieved 2009-09-30. ↑ "Resident population by ethnic group, 2001". Office for National Statistics. Archived from the original on 2011-06-29. Retrieved 2009-09-30. ↑ "Real Scot? Embracing Multicultural Scotland". Alastairmcintosh.com. 2000-04-13. Archived from the original on 2016-03-03. Retrieved 2015-08-10. ↑ "First Black footballer, Andrew Watson, inspired British soccer in 1870s". Black History Month. ↑ "Andrew Watson". 100 Great Black Britons. 1 2 "Andrew Watson". Football Unites, Racism Divides. ↑ Sir Norman Chester Centre for Football Research (June 2002). "Black Footballers in Britain - The Late 1980s and After - A 'New Era'?". University of Leicester. Retrieved 6 July 2008. ↑ "Letters". The Guardian. London. ↑ "History calls on Quashie". BBC Sport. 2004-05-26. Retrieved 2007-08-12. ↑ "Meet the Demoman". Teamfortress.com. Retrieved 4 August 2015.